The Alliance for Fair Food was born to stand with farmworkers confronting abusive conditions and sub-poverty wages in Florida's tomato fields. For decades, Florida farmworkers faced human rights abuses, including systematic wage theft, sexual harassment, health and safety violations, and in the most extreme cases, modern day slavery. In 1993, farmworkers in Immokalee, FL from Mexico, Guatemala and Haiti united and began organizing to change this reality. They would later become the Coalition of Immokalee Workers (CIW). After a decade of gridlock struggle with Florida growers throughout the 90s, the CIW identified that the root of their exploitation actually lay in the increasing degree of consolidation in the retail food industry: Multi-billion dollar brands were leveraging their unparalleled purchasing power to demand ever-lower prices from growers, which in turn created a downward pressure that perpetuated farmworkers’ poverty and abusive conditions. It was at that moment that the CIW began looking outside of Immokalee for allies who would support them in launching the national Campaign for Fair Food, which would demand justice in the fields from some of the largest food retailers in the world. Their demands were three-fold: that they support a wage increase by paying an additional penny more per pound of tomatoes; require a human-rights-based Code of Conduct to be enforced on the farms that grow their tomatoes; and that workers play an integral role in the monitoring and enforcement of these agreements. Founded in 1998, Interfaith Action of Southwest Florida was created to coordinate faith-based participation in the Campaign for Fair Food, bringing the spiritual resources of diverse faith traditions and the moral weight of faith-based voices when calling out exploitation in society. 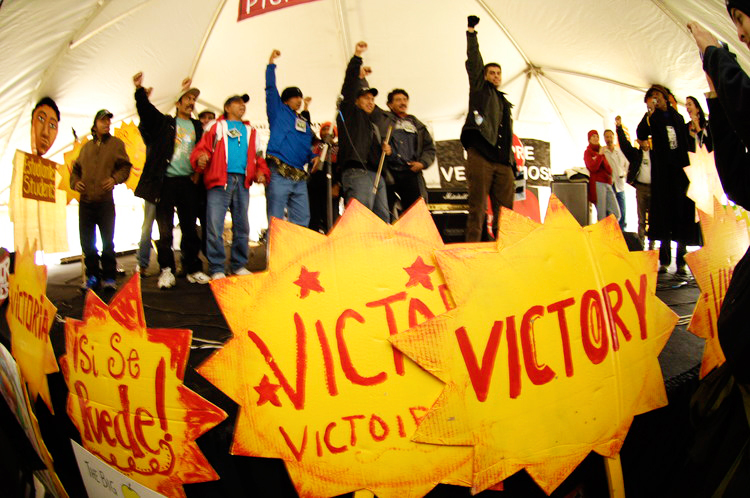 Founded in 2000, the Student/Farmworker Alliance began building a network of students and young people who saw themselves as targets of multi-billion dollar corporations’ marketing, and sought to use political education, leadership development and action in their solidarity efforts with the CIW farmworkers. Founded in 2007, Just Harvest USA was created as a bridge to the growing food movement, working to expand the notion of sustainable agriculture to include farmworkers’ rights and to ensure that those at the base of our food system are seen as integral partners in envisioning and creating a more just food system. The Campaign for Fair Food’s first target was Taco Bell, whose parent company, Yum! Brands, is the largest fast food conglomerate in the world. After four years of a national boycott — marked by “Boot the Bell” victories in over 25 campuses committing to cut ties with Taco Bell and the denominational backing of major faith institutions across the country — farmworkers and their allies won the first groundbreaking agreement with Yum! Brands in 2005. 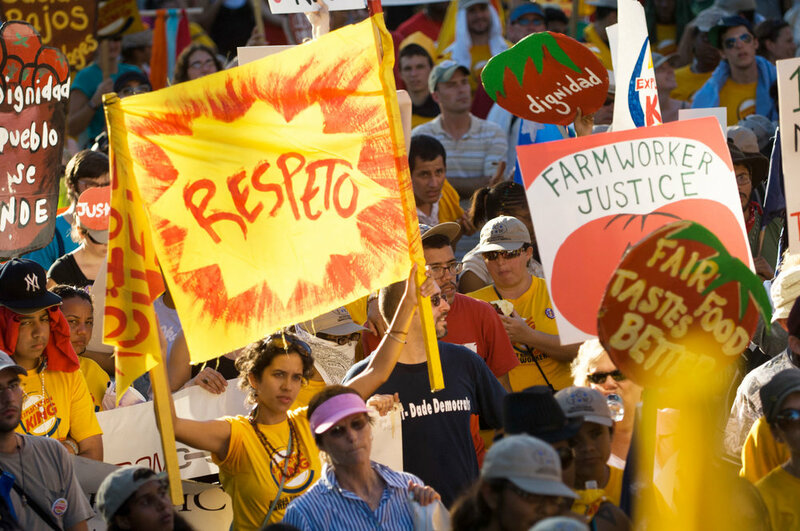 The CIW surged forward with the Campaign for Fair Food, securing subsequent binding agreements with McDonald’s in 2007 and Burger King in 2008. In 2010, after nine corporate retailers had signed agreements with the CIW, the Florida Tomato Growers Exchange, representing 90% of the state’s $650 million tomato industry, finally signed a milestone agreement to implement the changes farmworkers had demanded, leading to the creation of the Fair Food Program: a unique collaboration among farmworkers, growers and participating retail buyers. In 2015, the Program expanded into tomatoes in Georgia, South Carolina, North Carolina, Maryland, Virginia and New Jersey, as well as Florida strawberries and peppers. Today, the Campaign for Fair Food has won legally binding agreements with 14 multi-billion dollar food retailers, including Subway, Aramark, Whole Foods and Walmart. Tens of thousands of farmworkers are seeing never-before-seen rights in the fields, such as shade and water; the right to file a complaint without fear of retaliation; the right to work free of gender-based violence and modern slavery; and the first real wage increase in over 30 years. Our work alongside the CIW has radically transformed wages and conditions for farmworkers in the U.S. agricultural industry, and the Fair Food Program’s unique success has created a blueprint for implementing and enforcing human rights in global low-wage supply chains, known as the groundbreaking Worker-driven Social Responsibility model.